Quitting your job and starting a comedy career 4 days before turning 30, is probably not the smartest plan but that’s exactly what comedian William Lee Martin did in 1996. Three short years later he was opening for country legend, George Strait at the Alamo Dome in San Antonio, TX in front of 75,000 laughing concerting goers. That performance propelled William Lee’s career. Rising quickly to the role of headliner for some of the most prestigious clubs including the Funny Bones, Improvs, Catch a Rising Star, Loony Bin, Carnival’s Punchliner and becoming a regular in Las Vegas, William Lee first hit the stage under the lifelong nickname his grandfather gave him, “Cowboy Bill”. He has also entertained our troops overseas and toured with other country stars like George Jones, Brad Paisley and all four of the Blue Collar guys. It all culminated in his getting his first one-hour television special in 2015 on CMT called Cowboy Bill Martin: Let the Laughter Roll which was seen in over 1.7 million homes. 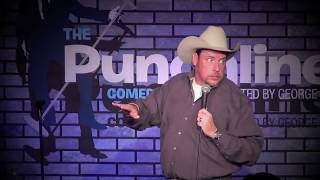 In January, 2016, Martin launched the Kings of Cowtown Comedy Tour with stand-up comedy newcomer and internet sensation, Chad Prather. Despite the success, William Lee once again made wholesale changes in life and career in 2017 including cleaning up his act, dropping the moniker, Cowboy Bill and getting his first movie role in the film, 300 Savage. Now with an impeccable reputation for writing accessible, original material with gut busting laughs, William Lee is hailed as one of most talented comedians working today. On social media, he writes and performs the hugely popular, The Living in the Middle Report, a hilarious explanation of problems facing middle-income America. Although William Lee’s passion is comedy, he also has written several songs including, I’ll Stand for You and 400 Horses. On the home front, William Lee is happily married. He and his wife are the proud parents of five beautiful children. William Lee and his wife also founded Cowboys Who Care Foundation, a 501C3 non-profit, to deliver cowboy hats to boys and girls who have cancer and other life-threatening illnesses. To date, CWCF has delivered over 8,000 brand-new hats across the country from New York to California. William Lee is kicking off his 2019 Runnin’ with El Diablo Comedy Tour and releasing two brand new comedy TV specials, Standing in the Middle and The Nutcracker Comedy Special. view more..
William Lee is kicking off his 2019 Runnin’ with El Diablo Comedy Tour and releasing two brand new comedy TV specials, Standing in the Middle and The Nutcracker Comedy Special.